New York is one of those cities where on any given day you can walk down a random street and find architecture that’s represents the “new” New York and the “old” New York. While ground up new developments and conversions dot the Manhattan skyline it is the “old” New York, the townhouses and historic brownstones that many might say makes New York one of the richest architectural cities in the world. When it comes to real estate inventory, many potential buyers are divided between fans of the “new” and fans of the “old”. Being a fan of pre-war and particularly brownstone architectural detail, I was thrilled when Norbert Beatty of The Corcoran Group, a savvy real estate broker with exquisite taste and a fan of pre-war detail himself, recently asked his client to hire me to stage a glorious floor-through apartment located on West 80th Street on Manhattan’s Upper West Side. 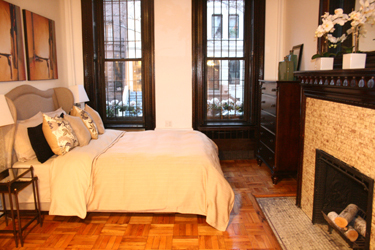 The one bedroom residence with den and oversized living room, is rich in pre-war detail, the precise type New York brownstones are famous for. From carved wood mantel fireplaces to wood inlay and gorgeous wood wall panel detail, this apartment has it all. In staging this pre-war gem, I felt it was important to embrace the past, while focusing on the present. 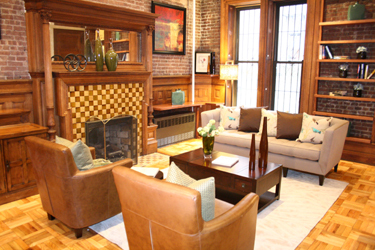 In other words, blend the old with the new, specifically blending old world charm with modern design. 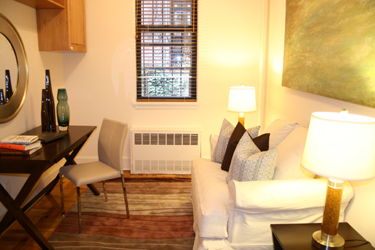 The challenge when it came to the home staging was to not create too modern of a design. When staging a residence, I begin first by considering the “bones” of the property and then determining what furniture, accessories and color palette, highlight the positives and showcase a properties best features. 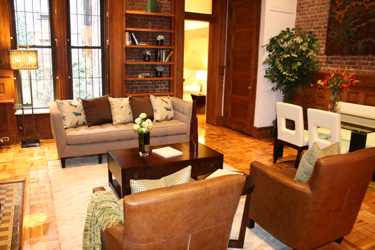 In staging this Upper West Side residence, I selected rich, taupe upholstered fabrics and then integrated toss pillows and pottery with accents of chocolate brown and peacock blue. The warmth of the chocolate brown worked well with the rich wood, while the peacock blue added a touch of the unexpected and created a modern edge.